We spent quite a bit of time on this question of whether God, who is love, is capable of hate. 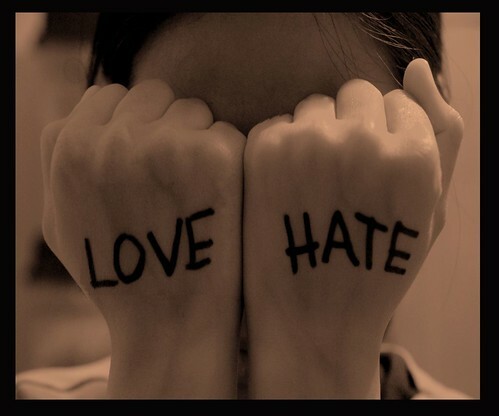 So…hate is grounded in fear, perfect love casts out fear, and God is love. It would seem that hate is not part of God’s makeup! But then what to do with all these scripture passages? Deut. 12.31: You must not worship the LORD your God in their way, because in worshiping their gods, they do all kinds of detestable things the LORD hates. They even burn their sons and daughters in the fire as sacrifices to their gods. Deut. 16.21-22 Do not set up any wooden Asherah pole beside the altar you build to the LORD your God, and do not erect a sacred stone, for these the LORD your God hates. Psalm 5.5 The arrogant cannot stand in your presence; you hate all who do wrong. Psalm 11.5 The LORD examines the righteous, but the wicked and those who love violence his soul hates. Proverbs 6.16-19 There are six things the LORD hates, seven that are detestable to him: haughty eyes, a lying tongue, hands that shed innocent blood, a heart that devises wicked schemes, feet that are quick to rush into evil, a false witness who pours out lies, and a man who stirs up dissension among brothers. Isaiah 1.14 Your festivals and your appointed feasts my soul hates. They have become a burden to me; I am weary of bearing them. Isaiah 61.8 For I, the LORD, love justice; I hate robbery and iniquity. Amos 5.21 I hate, I despise your religious feasts; I cannot stand your assemblies. Zechariah 8.17 do not plot evil against your neighbor, and do not love to swear falsely. I hate all this,” declares the LORD. Malachi 2.16 I hate divorce,” says the LORD God of Israel, “and I hate a man’s covering himself with violence as well as with his garment,” says the LORD Almighty. Those are all the instances in a quick search for “hate” that turned up where God does the hating. There are 118 more that are about people hating each other, hating God, etc. Using just these passages, “hate the sin, love the sinner” doesn’t seem to completely apply either. Yes, God appears to hate actions that hurt others and that worship other gods, but the psalmist suggests that God hates the people who do hurt also. And then there are the “I hate your festivals” which are usually followed up with some variation of “this people honors me with their lips but their hearts are far from me” and then a catalog of social injustices perpetuated even while festivals/sacrifice continue. So…does God hate? Can God hate? Is it possible for perfect love to hate? A new problem: none of these reference are New Testament. There’s not a single instance of Jesus or Paul using a word that gets translated as “hate” when applied to God. There’s plenty of hate going on, as in “the world hates you, but it hated me first” and “no one can serve two masters–he will either hate the one and love the other…” but no instances of God hating anything. It also does not appear that Jesus hated–he got angry, sure, he was disappointed, sure, he was frustrated or upset or even anxious, but there was no hate. Even at the last, on the cross, no hate–only forgiveness and compassion. Since, as Christians, the first place we are to look when we want to know what God is like is to Christ, this seems significant. God chose to reveal Godself to us in Jesus, and what we see there is love and compassion overcoming hate and fear and death. So…I’ve not answered a single question, I’m sure. But what do you think? Does God hate? What does God hate? Who? Why? And what does that mean for us?